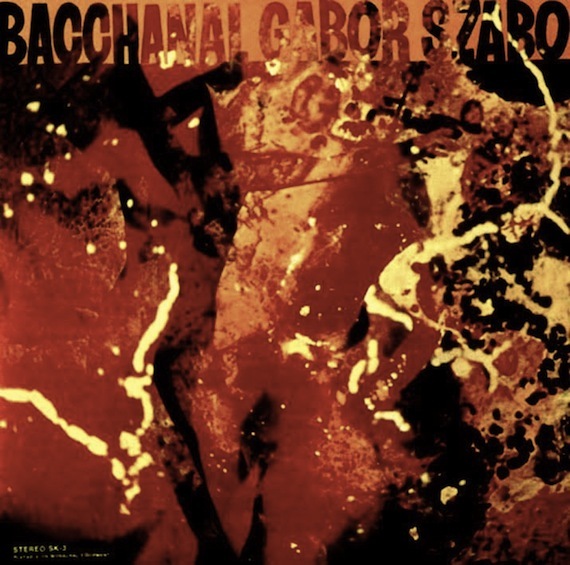 Culled from the 1968 Bacchanal LP, Gabor Szabo’s heady brew of jazz/psych/raga takes on Lee Hazlewood’s “Some Velvet Morning“. Both innovator and interpreter, Szabo’s instrumental interpretation stretches out rhythmically while retaining the Hazlewood/Sinatra vocal cadence/melody. And while the cover works best within the frame and aesthetic of the album, it’s far from a lite-jazz exercise. Thanks for posting this track. Awesome LP from a great and, imho, greatly under appreciated jazz artist. “Bacchanal” was the first of four albums recorded for the Skye label, which Szabo formed in ’68 with Cal Tjader and Gary McFarland. His blending of folk elements intrinsic to his Hungarian heritage was truly unique in jazz, as well has his early adoption of psych long before any other musicians from that quarter. I believe it was either Szabo or Miles Davis who was the first true jazz artist to play the Fillmore West. Actually, did a little research and the Charles Lloyd Quartet was the first jazz group/artist to play the Fillmore Auditorium, in ’67 (during its psych era; it was a major SF jazz venue prior to Bill Graham/rock period).